Yahoo Store's Social Media Sharing feature lets you add "Share on Twitter" and Facebook "Like" icons to your store's product pages, so customers can share your products with their networks on Twitter and Facebook. This boost to your marketing efforts can help you reach a wider audience, and can help to generate more quality traffic for your store. 1) It is only available in the version 3.0 template sets, so if your store is based on the version 2.0 template set, you cannot install the built in Social Media Sharing feature. 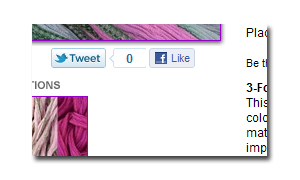 2) If you do have version 3.0 templates, the built-in social media buttons still only show on the product pages. 3) The look of the social media buttons is not configurable. It always shows the "standard" layout for the Facebook like button for example, so you cannot use the "compact" layout that only shows the button and the like count. Overcome these limitations by ordering our Social Media buttons. We install the Tweet and Facebook "Like" buttons in your store regardless whether you have custom templates or not, or whether your store is based on the 2.0 or 3.0 template sets. Asked for a custom look and feel to the buttons and Y-Times said "no problem". Looks great! Quick and easy with great communication. Thank You.